The Germans, as complainers, are well-practiced. They must be – truth be told, there’s not much in Germany to complain about; the economy is remarkably good, their public transportation is exceptional, and the beer is cheap. It is a happy time to be a German, if with a few exceptions – exceptions which are ruthlessly sought and endlessly exploited. One is the ever-simmering refugee crisis; another is asparagus. More than a clever nod to Germany’s famous white asparagus, and more, even, than a knowingly hypocritical criticism by a people known for their admirable (if not harmonious) relationship with the natural world, this expression is a manifestation of a cognitive dissonance on a national scale – that rift that must exist between history and progress, memory and imagination. The present is always bought at the expense of the past. Germany’s pristine countryside must be partially sacrificed in the name of clean air and sustainability. 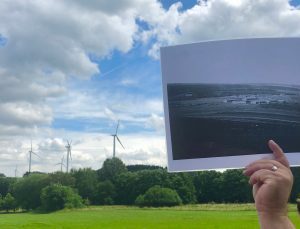 About two weeks ago I stood, facing one such gespargelte Landschaft – cropped green grass backed by a row of pines, with fields beyond rising gently to a hilltop, upon which white turbines turned bureaucratically. Beautiful, despite the asparagus. My view, however, was partially obstructed by a black-and-white photograph held aloft my tour guide, purporting to show the field as it was in 1940. Fifteen barrack-type buildings, haphazardly organized and bordered by an imperfect rectangle of barbed wire fences, occupy the now-bare field. A narrow dirt road can be seen, separating the main complex from a smaller assemblage of buildings. There are no wind turbines. SS-Sonderlage Hinzert was a small camp, used primarily for the incarceration of Luxembourgish political prisoners. Between 200 and 1,000 men were executed or worked to death in the camp and its surrounding forests; in 1942, in the wake of a general strike protesting compulsory Wehrmacht service for Luxembourgers, 22 were shot and buried in one afternoon. Minutiae, one might say , compared to the ghettos and death camps in Poland and Czechoslovakia. A historical footnote. The Luxembourgers would not agree – descendants of the victims continue to visit the small chapel near the site to pray, and to leave flowers. But, as the acres and acres of grass make obvious (unadorned for decades by so much as a memorial plaque), many Germans of the surrounding towns would just as soon forget the whole thing, and sublimate their guilt into a more general, national feeling – to cry for Auschwitz, a comfortable 2,000 miles away, rather than for the concentration camp bisected by a road they had to travel to reach the next town. Ironically, it was the French occupiers who tore down the camp in 1946. The Western victors aimed to orient the Germans as quickly as possible toward their political and economic future – to create a new Festung Europa against a new totalitarianism. Naturally, de-Nazification was an essential component of Germany’s transition to democracy, but even the Allies agreed: some things were simply not worth remembering. So Hinzert was destroyed, the landscape was scrubbed clean, and Germany experienced one of the greatest economic recoveries in modern history. For Germany, industrialization and economic progress were the only weapons able to vanquish a past that could not be executed at Nuremburg. The crimes could not be forgotten, but they could be distanced, placed on the shoulders of high-ranking Nazis and SS watchmen, all of whom were dead or in Argentina. The “average German” did not have to feel guilty. Indeed, he was not allowed to, if it distracted him from his role in the economic development of the new Germany – a Germany in which everyone had an alibi. Like any injustice, this collective distancing has been addressed time and time again, each time with an air of finality disproven by the next attempt. “Memory work” began in earnest following the protests of the “68ers,” young Germans born after the war who began to question the role of their parents and grandparents in the crimes of the 1930s and ‘40s . The 1980s saw an expansion of a normalized culture of memory – memorials were built, the Second World War became a central and inviolable theme in history classes, and countless books were written on the subject. In 2005, Berlin’s Memorial to the Murdered Jews of Europe – one of the largest and most impressive Holocaust memorials in the world – was opened, and to wide acclaim. There was, however, one unforgettable controversy: the anti-graffiti chemical used on the monuments was produced by a sister-company of that which produced the Zyklon-B used in the gas chambers. Modern Germans are no more responsible for the crimes of their great-grandparents than they are for the “economic miracle” of the 1950s, of which they reap the benefits. But so long as they continue to enjoy the legacy of a past in which they played no direct role, they inherit as well a responsibility to the memory of what came before the factories and wind turbines. Germany’s modernity has not yet been fully paid off. In the meantime, its debtors must not allow Holocaust memory to languish, and would do well to focus, rather than on the wind turbines that now mar their landscape, on the barracks which have been erased so they will mar it no longer. It demands a degree of dissonance, a simultaneous existence in both past and present, staving off the tyrannical encroachment of a progress-oriented future. But if Germany, as with any country with a history both reviled and revered, hopes to maintain its dignity not only as an economic power, but as a nation of substance – a nation worthy of respect – it cannot shun this responsibility. Enjoyed this. Also now want to try white asapagus.